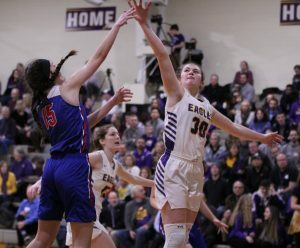 CANTON, MI (February 8, 2019) – The PCA Girls Basketball team returned home on Friday and their gala Homecoming celebration got off to a winning start as the Eagles knocked off the visitors from Parkway Christian, 51-18. Sophomore Ariela Boboc paced the Eagles on the defensive end with 12 blocks and 9 rebounds. Following a stirring ren dition of the National Anthem by junior Hannah Askew and the Eagle Pep Band setting the mood, the Eagles took a lead after the first quarter, 6-4. The physical play featured quite a bit of pushing and bumping. Freshman Anna Fernandez left midway through the period when she suffered a bloody nose but not before leading the team with four points. PCA’s shooting started to heat up in the second. Harlee Collins and Fernandez hit a pair of threes to give the Eagles a lead they would not relinquish. Another triple by Fernandez at the buzzer gave PCA a 19-9 lead going into the break. Fernandez led the Eagles with 12 points, Collins added 5 and senior Sarah Fernandes had 2. On the defensive end, Ariela Boboc had 7 blocks and Ella Godin had 7 rebounds. After celebrating the successes of the cross-country teams, the golf team and the baseball team, the second half got underway. 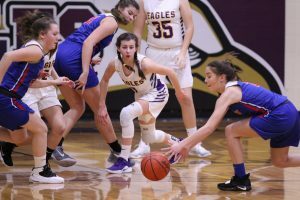 The Eagles ramped up their defensive effort and got some timely three-point shoo ting from Isabel Mossel as well as Fernandez to extend their lead to 32-13 after the third quarter. The fourth quarter saw a continuation of the physical play. A Parkway player received a cut under her left eye and the game had to be stopped as she received medical attention. Once play resumed, the Eagles kept up the offensive assault. Eva Warmbier and Emma Heussner chipped in with baskets and PCA outscored Parkway, 19-5 in the final stanza. In the end, Plymouth Christian celebrated Homecoming in grand fashion with a convincing 51-18 win. 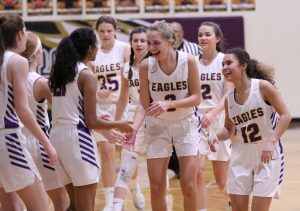 Leading the way for the Eagles was Anna Fernandez with 22, Ella Godin had 6, Harlee Collins and Sarah Fernandes had 5, Eva Warmbier and Isabel Mossel had 4, Ariela Boboc had 3 and Emma Heussner had 2. Defensively, Ariela Boboc had 12 blocks and 9 rebounds, Ella Godin had 9 rebounds and Rachel Costello had 1 block, 1 steal and 2 rebounds. PCA will be on Mid-Winter break for the next week but will play a pair of games. On Tuesday, February 12, they’ll host Lutheran North West at 6pm and on Thursday the Eagles take to the road to play Huron Valley Lutheran – game time is 5:30pm.